Coventry City London Supporters Club – Representing Sky Blues Fans in London, the South East and Beyond. At the Calthorpe Arms, Greys Inn Road. 6.30pm for 7pm start on Monday 14 January. Members should have received notification via email. The membership section has been updated and is ready for renewing and new members. IMPORTANT: You will only be able to access & book travel and match tickets if you are a paid up member. There are also free options for overseas Sky Blues fans (Sky Blues International) and newsletter subscriptions for UK-based fans who want to keep up with what’s happening. Full details and application forms are available via this page or the Membership menu. Travel and match tickets are now be available to order for this season. Use the order form here on the travel page and here on the match tickets page. 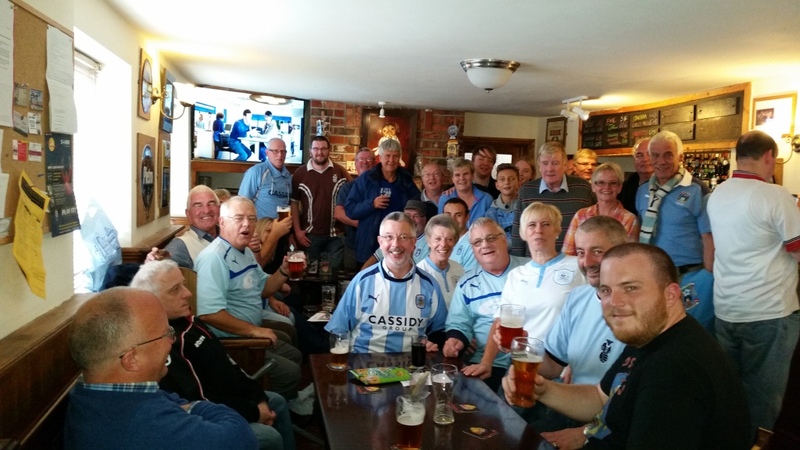 Members will be meeting at the Gatehouse Tavern in Coventry before every home game and a designated pub for nearly every away fixture. Pub details are in the member newsletters. If you are buying from Amazon, go there via this link & CCLSC will get 5% of your purchase amount as commission, at no cost to you. We have an exclusive range of CCLSC merchandise available from our Tacklebag online shop. Enter CCLSC_FREEPOST to get free postage. Click here to buy now!